I am participating in Blogmania, a whacky free-for-all giveaway encompassing 123 blogs. If you stop by Bertram’s Blog on April 30th and leave a comment, you will be entered into a contest to win a print copy of Daughter Am I. Since the novel is the story of a quest, I am also including a couple of travel essentials to accompany the winner on his or her journey -- a journal to note your own travel experiences and a Burt’s Bees travel shower kit. Promote My Novel: What is a message board signature and how can it help you promote your novel? A week ago, my editor sent some general suggestions to improve my novel. One involved charting characters’ relationships to my protagonist, Casey, to determine their importance and relevance to the story. I thought I knew all about these relationships because I compiled something similar after starting the book way back when. So it was startling to realize that after all those drafts and a newly critical pair of eyes, some relationships now don’t seem as necessary as they did during earlier rewrites. In fact, two characters are now banished forever. You’ll never know who they are and it’s not important that you do because they simply didn’t matter much, which is the point of the exercise. The second task I’m still working on involves charting a timeline for every event that happens in the book. Again, this is something I did at the beginning, but rewrites changed things. When I started the timeline this week, I quickly realized that the timing of some events doesn’t quite work anymore. Needless to say, I’m happy, if not downright relieved, to be going through this process, but I tell ya, I have my work cut out for me. Have you ever watched a show or a movie and wished the story or characters had gone another way? Or read a story or book and thought about the characters afterward, or imagined what the story would have been like if one of the secondary or minor characters had been at the center? Yes, I know, that's called fanfic or fan fiction, and many writers frown upon it. My point is, it's a form of writing to a market, and it's a start. What you want here is the ability to analyze a magazine or anthology to see what kind of stories they like, and if they're the kind of stories you have in you. Some people go so far as to outline printed stories and write character sheets on the characters. After they've done this for several stories or book titles from one place, they know what appeals to the editor. Others just read the stories and see if they get a feel for common elements. and keep it on the surface? Are cats okay? Talking cats? With these common elements in mind, maybe you can build a story incorporating them. Or maybe one of the stories that just come to you will magically have these elements as part of it, just because you've put that set of blocks in your toybox. broccoli stems and calling it slaw. Maybe you like broccoli slaw, but it still ain't cabbage. It's Spring and the Ideas are Blooming! While waiting for my editor to complete her edits, I’ve decided that the best way to pass the time is to do one of the things I love most in this world: start writing a new novel. This is a rare thing for me because, as I’ve mentioned in previous posts, I spend ninety percent of my writing life revising and editing and editing some more. I’ve been working on the first two chapters and now that I’m thinking about the next two, ideas are popping into my brain at a rapid rate. It happens while driving, at work, buying coffee at Tim Horton’s, doing dishes, having a bath, or grocery shopping, among other things. It’s an amazing feeling. Today, I collected a quite a few notes for chapters three and four, partly because it’s been a peaceful, warm, sunny day, but also because new books and new ideas go hand in hand. Already, I’ve realized that chapters in my outline are in the wrong order, but that’s fine. Outlines are made to be changed. At night, I need to read someone else’s book to shut thoughts of my own book away or I’ll never sleep. I admit, though, that plenty of ideas come while I’m half asleep. Still, I need a sharp, alert brain to organize these ideas and connect them to other ideas already percolating. Lord, I love this process! Blogmania -- One Day Only. Mark Your Calendar! 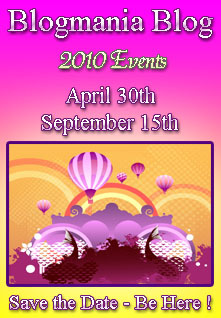 On April 30, 2010, I am going to participate in Blogmania, a one day massive blog giveaway. Picture it as one of those 200 mile long garage sales that attract thousands of shopaholics because of its size. The people who go to those events love the pure adventure of seeing how many miles of garage sales they can personally cover in one or two days. On Blogmania, you don't have to purchase anything. Nor do you have to wear out your shoes tramping from sale to sale. It's all online. And every participating blog is giving away something special. I will be giving away summer traveling companions. Sort of. Everyone who leaves a comment on my blog on April 30 will have a chance to win a print copy of Daughter Am I -- the story of an incredible journey -- along with a Burt's Bees Travel Shower Kit and a journal to record your adventures. Hope to see you at the end of April! I have a 72,000 word mystery novel to edit in less than three months. I’m not even asking myself if I can do it because failing is not an option. This week, I met my publisher’s editor via email and was asked to send a detailed sketch of my main character, which wasn’t hard to provide since I developed one ages ago, then added bits and pieces over time. It was good to finally update my notes into one organized document. One of the great things about writing a series is that you can explore depths to your main characters that you never imagined when you first started writing. Characters might start off being composites of people you’ve known, yet they evolve into unique beings that seem just as real as your friends and co-workers. Whether you’re writing a stand-alone or a series, I definitely recommend preparing a detailed character sketch which should be updated once in a while. One day, an editor might ask you for it, and wouldn’t it be great to have a polished one ready? The other piece of information I’m providing is a timeline of events that we’ll be referring back and forth to during the editing process. Again, a great idea and one I also prepared while writing the book to help me place events at the right place and time. Knowing when things happen in a mystery helps me keep sight of the big picture, and makes it easier to refer back to events when my memory inevitably falters. I can’t wait to start the actual editing. After all, it’s ninety percent of what I do as a writer. Gripping and mesmerizing from the very first chapter, Rick Mofina’s latest thriller explores a chilling conspiracy that is guaranteed to get your heart pounding. A car crash in Wyoming, involving a young couple and their baby, sets The Panic Zone into rapid motion. The next day, a reporter in Brazil gets a call to meet an unidentified woman at a café; the woman claims to have a news story, and the documents to back it up. The reporter and her photographer friend have no idea what they’re walking into, and the resulting chaos sends World Press Alliance reporter Jack Gannon across the globe in search of the truth. But the truth is more shocking than anyone could fathom. A twisted scientist gathers a secret group of conspirators and puts into action a horrific plot that threatens the very existence of mankind, proving once again that science can be a deadly plaything if it falls into the wrong hands. From human experimentation without consent, to a killer virus constructed from some of the world’s deadliest toxins and a unique delivery system that will chill you to the bone, The Panic Zone will keep you turning the pages. With a storytelling talent comparative to Michael Crichton and Robert Ludlum, Mofina expertly weaves the plot with intricate, terrifying and believable details. The Panic Zone is excellently researched and the clearly defined chapters show alternating points of view as only a master writer could achieve. Another Mofina masterpiece―one I can’t recommend enough. In the zone, so far in the zone I have zoned out. My writing rhythm feels solid as March flips into April, which is good news for my personal writer’s challenge but bad news for my already over-burdened mind. I struggle with reality, the small tasks that get me from here to there. Things like going to work-work. You know, that full time position that buys dog food, gas for the scary Toyota and broccoli, I cannot let a day go by without broccoli. Then there are the dreams, some so vivid I feel I can retell the experiences. Why would I be on an Air Lingus flight in an airplane made of concrete with no windows and pilots seated at a banquet table facing the passengers while the passengers, including me, sit on stadium benches. Weird, I need dream analysis pronto. Three months down of my six to novel completion, this writer’s challenge seems like the cement airplane in my dream, how the you-know-what is that puppy going to get off the ground. Is Writing Your Art or Your Business? I’ve been reading an interesting book about how to achieve great success in business. I’ve read a couple of books like this before and the theme and strategies are pretty much the same in all of the books. The authors state that through techniques like setting goals, visualizing same, applying affirmations and other things, you can achieve the success you want. The authors of the book I’m reading even go into the science that explains how programming your brain to think this way works. These authors take the techniques, science and strategies behind successful lives a few steps further than I’ve read elsewhere, and if the steps are diligently followed they probably could produce positive results. But here’s the thing: can it be applied to writers, especially fiction writers who write novels rather than nonfiction authors who compose articles, brochures, flyers, and newsletters, for instance? Is writing, regardless the material you write, a business? In my opinion, the answer is yes. But it’s also your art. Obviously, writing a novel or short story is an enormously creative act that comes from imagination, life experience and research, to varying degrees. You can’t and probably shouldn’t rush it. Ideas, plots, characters, subplots, pacing, twists and turns need time to develop and blend together in a seamless, compelling story. But once that work is published and the promotion and marketing begins, your writing life becomes your business life. And this is where business books can be useful. For example, do you know who your target market is, specifically? Answering with something like readers between 20 and 75 isn’t good enough. Do you know the most efficient way to reach your target market? How will you find them? How will you entice them to buy your product? How many books do you plan to sell? Where? How? If you want to sell what you write, it might not be a bad idea to put down the how-to write books for a bit and pick up some business books.